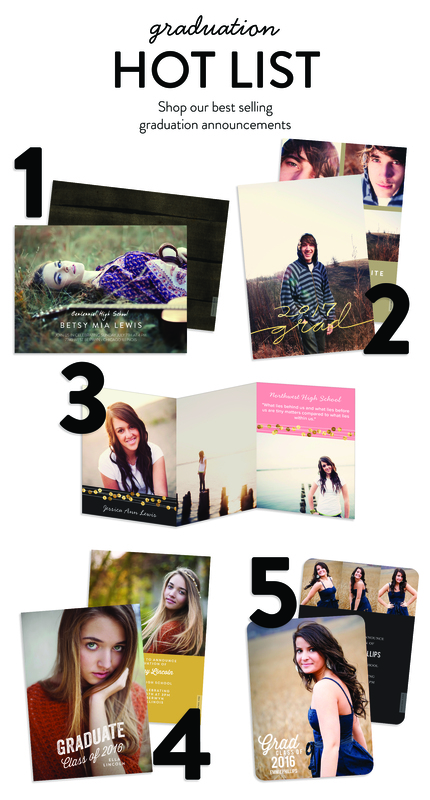 Shop our top graduation announcement ideas if you’re looking for a sure hit! These best-selling graduation announcements and invitations are easy to create, let you show off one or more photos, and can be personalized with your choice of background colors or patterns. 1. Mixed Font Message It’s all about the photo with these luxury graduation announcements printed on double thick paper. Choose your best shot, then pick the backer and you’re done! 2. Gold Foil Follow The Script Flowing gold foil script announces your class year and grad status on the front, with room for three more photos and your graduation details on the back. 3. Gold Sequin-Look Trifold Strands of gold-colored faux-foil sequins are strung across your photos on these trifold graduation invitations, adding a little faux bling to your event. 4. Rustic Grad A distressed font, editable text, two large photos and your choice of colors let you create graduation announcements with a rustic flair all their own. 5. Favorite Photo These classic graduation invitations feature a full photo on the front and three photos on the back. Rounded corners and your choice of colors make them yours. Ready to create your own? Choose from our top 5, shown here, or shop the entire collection of graduation announcements and invitations from Pear Tree! ← PreviousGenevieve Gorder Stationery is Here!